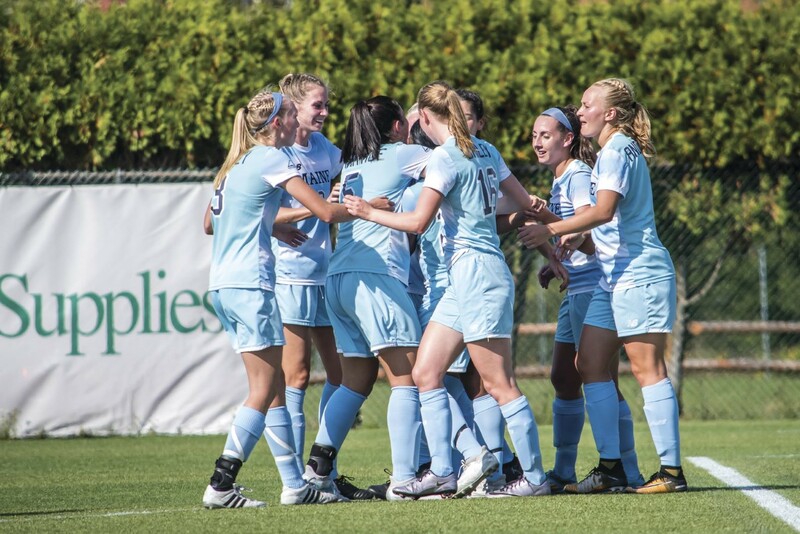 University of Maine’s women’s soccer team (4-3-1) left it all out on the pitch this past Sunday night as they played University of Maine Machias (5-2-1) in Orono. The team pressed on Machias’ defense for much of the game, ending in an impressive 11-0 final score. For all of the 11 goals, nine players contributed to the overall score. The Black Bears took some time to warm up, but junior Nicole Bailey got the ball rolling with a beautiful shot midway through the first half off a pass from sophomore Olivia Bamford. First-year defender Susannah Gaines gracefully placed the next shot into the goal off of a corner kick, with an assist by first-year Amanda Sandberg at the 30-minute mark. Almost immediately after the whistle blew for Machias to advance on offense, the Black Bears intercepted. This resulted in an open shot and goal from first-year Saylor Clark, a goal that was only possible due to the precise pass that came from junior Anna-Maria Dagher. To end the half, sophomore Charlotte Messer raced the clock and found the back of the net, with less than 30 seconds to go, thanks to a pass from first-year Emma Donovan. This goal ended the half with a comfortable lead of 4-0 for the Black Bears. Messer, along with Bailey, were able to score again in the second half to claim the title of the Black Bears’ leading scorers for the night. The second half continued strong, with Maine’s offense continuing to tear through the Clippers’ defense. A total of seven more goals were scored, five of them hitting the back of the net in a span of 10 minutes. These second-half goals were scored by Bailey, Julia Mahoney, Priscilla Domingo, Kora Kukk, Charlotte Messer, Gaby Panagakos and Lauren McCann, respectively. Throughout the game, the Black Bears defense acted as an impenetrable wall. They fought hard, not allowing any of the Clippers to take an on-target shot. This is a stark contrast to the Black Bears’ 29 shots on goal. This resulted in a clean sheet, and the Black Bears’ keepers Alison Toby and Annalena Kriebisch weren’t forced to save any shots. This game also had multiple career first goals. These goals were scored by three first-year players Saylor Clark, Gaby Panagakos and Lauren McCann. Out of the nine scorers of the night, five were first years. The next game for the Black Bears will be at 1:00 p.m. on Sunday, Sept. 22. The team will travel to Stony Brook, NY to play against Stony Brook University (5-5). Stony Brook University has more losses than UMaine, but the team also faces a more difficult schedule. The following Thursday, Sept. 27, will hold another big game for the Black Bears, as they will face off against rival University of New Hampshire (4-4-1). Between the rivalry and the nearly identical records so far this season, it promises to be an interesting match. The game will start at 7:00 p.m. and will be played at UMaine.